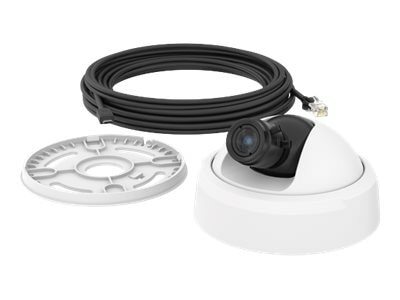 AXIS FA4115 is a compact varifocal dome sensor unit for discreet indoor video surveillance in stores, offices and banks. For use with an AXIS FA Main Unit, AXIS FA4115 provides a 1080p resolution and flexible viewing angles ranging from a 53º to 99º horizontal field of view. A narrower field of view enables finer details to be captured. In wide mode, more of a scene can be covered. AXIS FA4115 uses Forensic WDR (wide dynamic range) that is tuned for motion. The unit comes with a mounting bracket and an 8-m (26 ft) cable for connection to a main unit.